In my analysis I had forgotten about the use of catch up contributions at the ever approaching age of 50. According to the TSP website a member age 50 or older (or turning age 50 during the calendar year) can contribute $6,000 on top of their $18,000 as a “catch-up” According to my estimation data found here, at the age of 50 I will be an O-6 with 20 years service. This would mean a $24,000 contribution that year, with a 5% base pay match of $5,908.68 with BSR. Total of that is a $29,908.68 after tax contribution to my Roth TSP. Remember since you paid taxes on this money, all future earnings will not be further taxed. 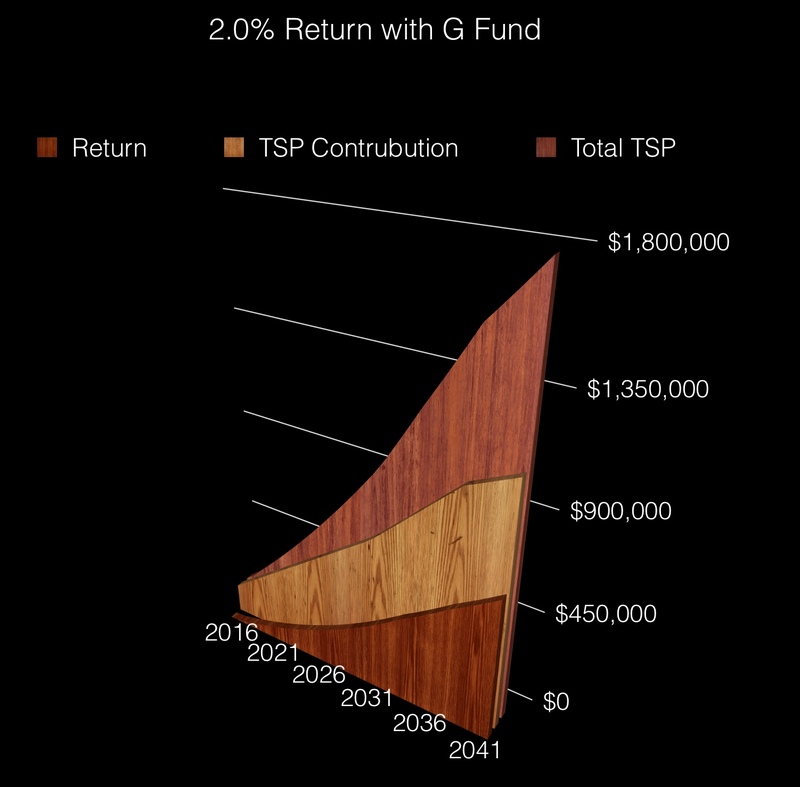 Even using the 2% earnings on keeping everything in G Fund we can reach easily $1.78 million combined TSP at age 60. This is composed of $1.15 million in TSP contributions between the two of us for 30 years. Then you have $672,740.18 in returns in matching and 2% compounding return. This of course would barely beat inflation of around 2%. I am certain that even $1.78 million would not buy the same as it does today. $1.15 million savings seem like a staggering amount, but it is $50 a day per person for 30 years with an increase of $16.40 a day after age 50. Yes, for the price of $50 from 28 to 49 then $66.40 a day after 50 to 60 you could have over $600,000 saved up without any returns at all. 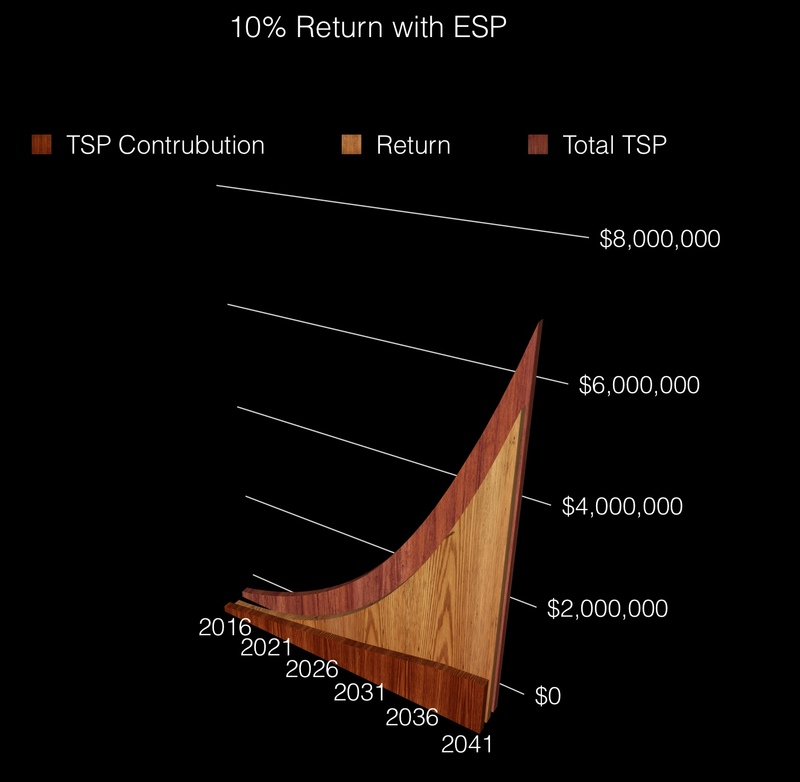 This year using TSP pilot I was able to get 4% return, I will assume if I got 4% for the next 25 years we would have $2.4 million dollars with the same $1.15 in TSP in contributions. That is a nice $1,358,730.64 in returns for a achievable 4% return, Hell I am sure some of the life cycle funds would return that. The Target 2040 fund would be the ideal fund for us if we wanted to be lazy, it automatically re-allocates according to the interactive pie graph on the link above. Both Dave Ramsey and I agree that its far too conservative and not responsive to market conditions. It might be the only thing we agree on, just stick with TSP pilot (or the free TSP Allocation Guide) will ya? Whatever you do, don’t hire a financial advisor who will just rip you off on high fees and S&P and other index clones. Your gift for your service is access to these low fee funds via TSP and a free on base financial counseling. These retail “financial advisor” assholes try to sell you on something that is exactly the same product but up to 10 times more expensive. You don’t notice your getting screwed, because they lift the fees right from your earnings. I’m looking at all of my mom’s investments and there all terrible, shame on you Edward Jones, Fidelity, Bank of America for ripping off this poor old lady over the last 30 years. Bank of America being the worst offender charging $75 a year in management fees with another $75 to close the damn account worth only $2,000. If you have no access to TSP, then Vanguard is the only thing that comes close in terms of fees. If you disagree with me, tell me which fund had crushed it over the last 30 years which you had 100% invested in that can beat the respective index. Don’t fall for the Texas sharp shooter fallacy either, you can’t back test investments using known good data. Your out in town financial advisor is not your friend, they are civillians that has no idea about TSP and would love to earn sweet kickbacks on their own product. I haven’t used the on base financial counseling, but I am a little more trusting in someone paid by third party (the DoD) that will not push an overpriced funds under the guise of being your buddy. If your actual buddy or family is a financial advisor, then tell them you have a much better system that that could not ever comprehend with 100% of their own brain power. These people have no idea, do not take advice from them. Sorry Fred, thanks for the advice, but I don’t need yet another term life insurance sales pitch. Let’s just say you were able to accurately predict every market movement for the next 25 years and somehow achieve (a not entirely impossible) 10% return with ESP. Maybe you think your the Gordon Gekko of TSP then we see some insane numbers, with your $1.17 million you would have $7 million with a return of $5,927,917.09. Remember the rule of 72 here in your calculations. Since at this 10% return rate your money would double at 7.2 years. That is 3 and a half doubling events in 25 years! As you see even if I did 20 years and my wife does 24 years we would have $273,920 more with the TSP matching, but there would be a pension cut of 20%. At the new rate 2% per year served per 3 years of averaged highest base pay we would take in $8,710.98 a month instead of the old $10,888.72 at the 2.5% rate per yer of base pay. This loss of $2,177.74 per month would be out weighed by the $273,920 combined match since 2018. This is the equivilent of 126 months worth of loss in pension. It would be the equivilent of up front pension pay for 10 years of retirment all usible at the first day of retirment at 59.5 years old. All my here and charts are here if you want to make your own compelling argument to your enlisted staff. Even many of your fellow officers don’t realize the amazing power of compounding returns. Maybe they only know componding interest the other way with a bad car loan.